Every mover wants more free Google traffic. This free, or organic, traffic comes to your website when you rank for terms people search for in Google. 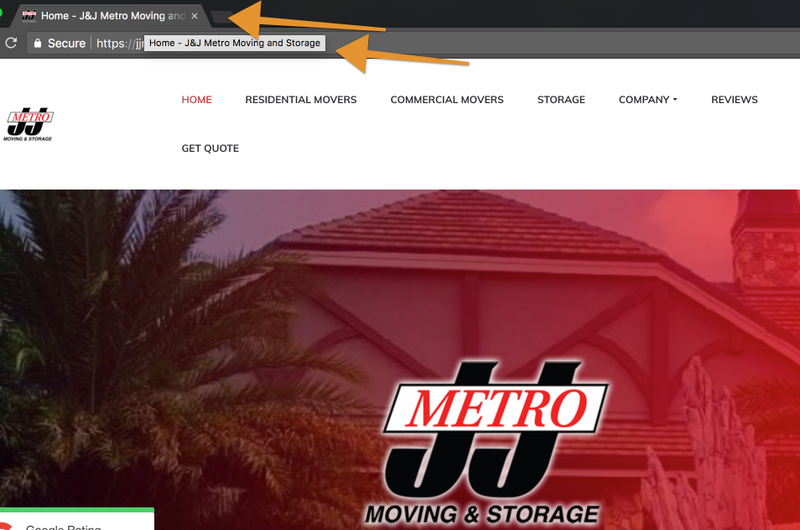 People that search for terms like, “Chicago movers”, “Salt Lake City moving companies”, or “movers in Orlando”, see your company’s website, click on the result and land on your website. Boom! You now have an extremely qualified visitor that hopefully you can turn into a customer. So how do you get on page one for certain terms? Which terms will bring the most traffic? Which terms can you rank for? Great questions! 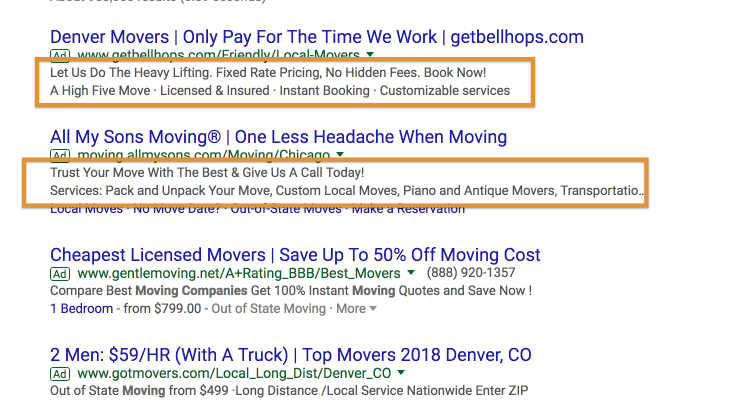 I’ll answer those in this blog post, as well as tell you how to do three simple things today that will get your moving company ranking higher for the best terms within a week or two (side note: if you want to see what a good mover adwords/cpc/sem campaign looks like, check out our mover sem case study). Ok, let’s get you ranking! Do these three simple SEO (Search Engine Optimization) tips today and see your rankings and free traffic jump. Oh yeah, we included a couple little-known bonus tips to give you an extra boost! This tip is ridiculously easy for you or your web developer to make. It should take no more than a few minutes and deliver results within a week or two. See the bonus section to give this change an extra boost. Why is this important? Because it’s what Google uses as the title your listing in search results! Google uses it to figure out which search terms your site should appear for. Did you know consumers search for “Orlando movers” 450 times per month but only search for “Orland moving companies” 250 times per month? Which would you rather rank highly for? Google watches how many people click your search result versus other search results. If your listing entices searchers to click more than other search results then Google will rank you higher. 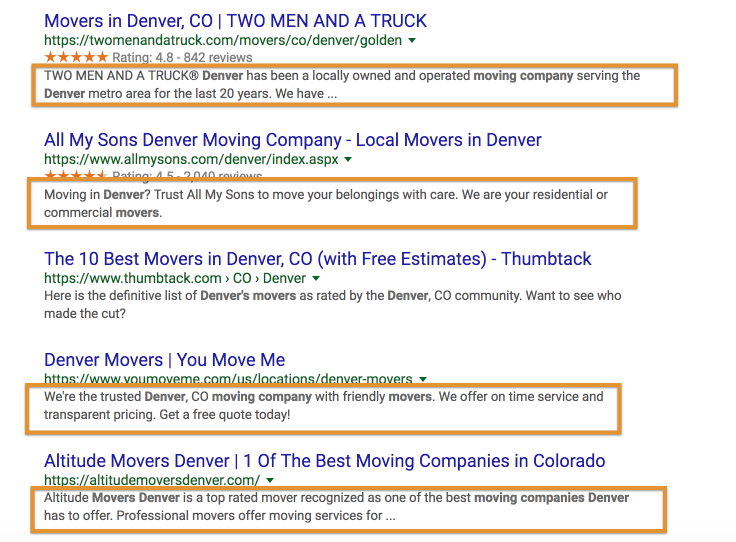 Lots of consumers search on mover names! Check out the search volumes for these movers in Chicago we got from SERanking, a great SEO tool we use. 2 Guys and a Van clocks in with 480 searches per month, Coffey Brothers Moving brings in 320, and The Professionals Moving Specialists has 210 Google searches per month. Those numbers nearly match the more generic search numbers we see for Orlando (keep reading to see them)! Every one of them makes the company name an important part of the title. Yelp mentions photos and reviews, the BBB brags about themselves, and HireAHelper includes the phrase, “Movers in Orlando”. Putting a keyword for your city after. For good keywords, check out the Google search volumes for these Orlando moving terms. We pulled these from ahrefs.com, a fantastic SEO research too. 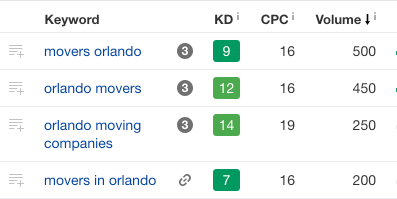 “Movers Orlando” has the highest search volume, followed by “Orlando Movers” with a bit less. I’d personally recommend the first, as consumers reading that result will likely appreciate the better grammar and click on it more. Make the change today and see how fast you shoot up the search results for your company name and the keyword you chose! You may be asking yourself, what the heck is a HTML meta description? Great question! In your website’s code, it looks like this. This example is from Stallion Moving Services in Denver. You’ll notice that the words Google uses come right from the meta description in the code on Stallion’s page. Why is this important? A 2017 study of the top Google ranking factors by SearchEngineLand.com listed your search listing’s Click Through Rate (CTR) as a very important signal to Google as to how high they should rank your site in search results. This means the more compelling your description, the more people will click on your listing, and the higher Google will rank you. If you run adwords ads, look at your ads that perform the best and see what the ad copy is. Use that to help you craft a great description. Mover SEO Tip #3 – Put Your Address and Phone Number on Your Website! Your address and phone help Google determine where your moving company is! Without it, Google may have trouble knowing if you’re a Boston mover or Austin mover. Consumers may get frustrated and leave if they can’t easily find your address and phone on your site. You want to know another signal Google uses to figure out how high you should rank? The time people spend on your site after landing on from a Google search. Don’t confuse them and make them leave right away, show them the info they want so they stay and give you a call. Hopefully you found these three simple tips helpful. Now what are you waiting for? Go make the changes!
. . . but before you do, keep reading for our bonus section that has a few little-known tips to help boost your Google ranking further. Bonus Tip #1 (free! 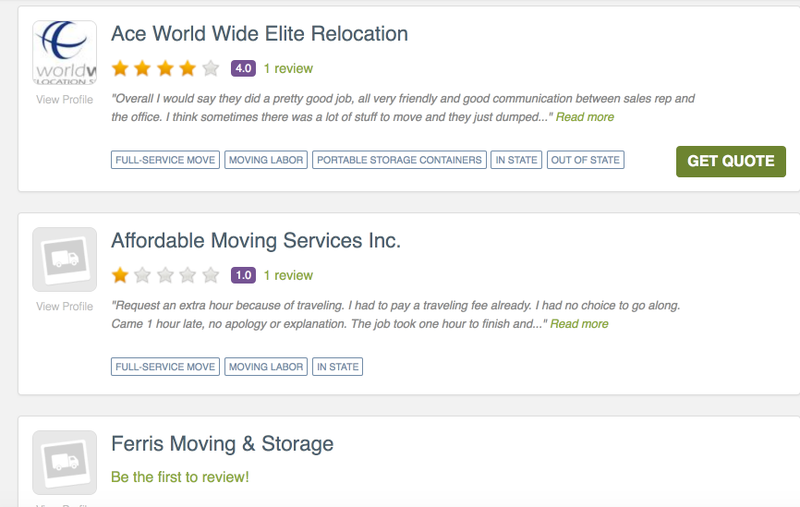 takes 5 minutes): Make sure your profile on MovingCompanyReviews has the link to your website, and that the link is correct. Here’s a great example from Moving of America in New Jersey. Why is this important? Because Google counts links to your website as votes for it! All links are not created equal. A link from a quality site (in Google’s eyes) counts much more than a link from an unknown website. 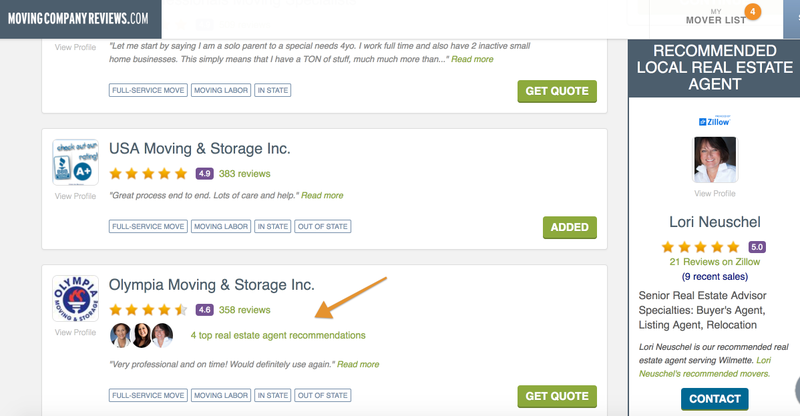 Google counts links from MovingCompanyReviews as high-quality links and a strong vote for your website. IMPORTANT: some websites will put a “nofollow” attribute on links to your site. That tells Google to ignore the link and not give it any value. Not us! We want to pass the Google ranking benefit on to our movers. Why is this important? Because the higher your listing is in our search results, the more important Google thinks it is! Google tends to give higher importance to links that come earlier on a page, and by ranking highly in our search results you can tell Google your site is important. If you know any agents interested, have them drop us a line at support@movingcompanyreviews.com! Hopefully these quick SEO and mover marketing tips help your company increase your free Google traffic and free leads. If you have deeper questions or would like to contact us, just drop us a line at support@movingcompanyreviews.com.